List numerous sustainable characteristics of structural steel. Establish an appropriate methodology for comparing the environmental impacts of structural framing materials. Examine the cradle-to-cradle supply chain for domestically produced and fabricated structural steel. 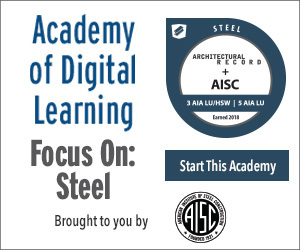 Identify strategies for minimizing the environmental impacts associated with structural steel. Locate available resources for additional information on structural steel sustainability. What portions of the building are to be considered in the analysis? How are the building alternatives selected? What is the basis of comparison between the two building alternatives—materials or design? At what stage of design should the comparison be performed? How will the quantity of materials used in the two alternative building designs be determined? How accurate are the material quantities being used? Is operating energy to be included in the evaluation? What was the scope of the collection of the impact inventories? Are all product inventories consistently using the same scope? What methodology and assumptions were used in determining the environmental impact inventories for each product or material? What is the veracity of the environmental impact inventories used for each material or product? What environmental impact categories will be evaluated? What level of environmental improvement is desired for each category? What level of environmental detriment will be tolerated in each category? How will impact categories be prioritized against one another? While the environmental product declarations (EPDs) furnished by a growing number of building product manufacturers and industry associations can help building teams fill in some of these blanks, they are limited in their contribution toward this end. As a case in point, MKA was recently commissioned for a project where the client wanted to pursue an all cross-laminated timber (CLT) design. To thoroughly vet the option, MKA created comparative options and analyzed various options, in detail. In the end, the structural engineers parametrically combined the options in optimized building choices. “Even with the optimized mass timber frame, it was not a clear, low-carbon winner over efficiently designed composite steel or other frame alternatives, when all comparative building requirements, including acoustics and vibration, were taken into account,” he reports. Ultimately, an efficiently designed composite steel frame showed a slightly lower total cradle-to-grave carbon footprint, but the variability between the EPD data didn’t allow for declaring any one winner on a material-only basis. On that note, Christopher Alt, RA, principal, Studio Ma, Phoenix, states that building with steel typically results in more openness and transparency, taking up less space within the floor plate. Overall, this usually yields a higher net-to-gross ratio, freeing up more usable space within the same footprint. Or, conversely, it allows for smaller buildings with the same amount of usable area. While simplified tools that estimate environmental impacts may be interesting, they should not be relied upon to accurately determine the relative environmental impacts of two alternative building designs. Any whole building LCA comparison must be based on structural quantities determined by a licensed design professional competent in the practice of structural engineering using an analytical design tool, not parametric estimates of material quantities generated by a simplified LCA tool. Just as a competent structural engineer should be determining material quantities, a competent professional skilled and experienced in the performance of whole building LCAs should perform the LCA. This task should not be assigned to a member of the design team who is unskilled in the use and interpretation of LCAs. At this point in the evolution of whole building LCAs, the comparison of iterative designs using similar products and materials is much more instructive, reliable, and worthwhile than attempting to compare buildings with dissimilar materials and products. Evaluation of building operating energy is best performed outside of the LCA by energy professionals using tools specifically designed for that level of analysis. Material producers and product manufacturers should be encouraged to publish environmental impact inventories for their products that clearly delineate the scope and methodology used to determine those impacts. Any comparison of materials, products, or combinations of materials and products into assemblies and/or the whole building should only be performed when all products and materials are using consistent scopes and methodologies. Rather than rely on a cookbook approach to determining the relative importance of increases and decreases in environmental impacts, the design team should evaluate a broad range of impacts in the context of global, regional, and local priorities. 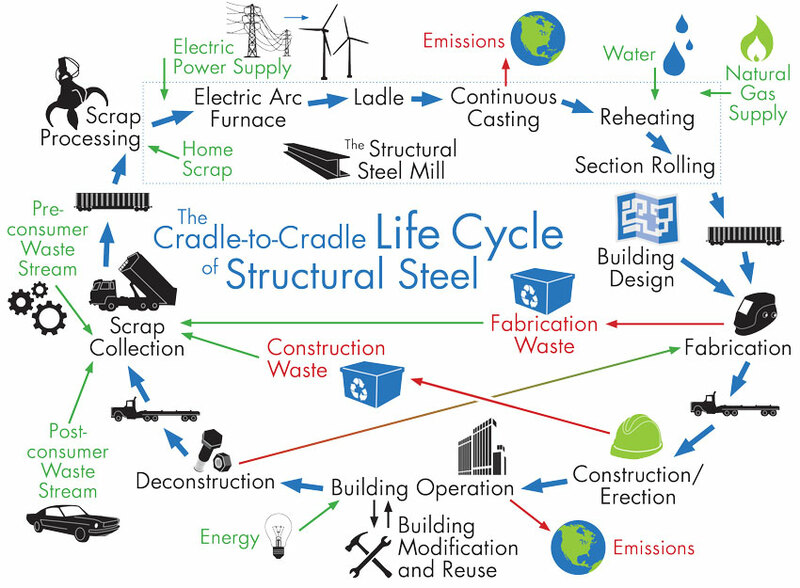 Shown is the cradle-to-cradle supply chain of sustainable structural steel. The process begins with scrap collection following by scrap processing, mill production, transportation to a steel service center/warehouse or fabricator, fabrication, transportation to the job site, erection, building operation, deconstruction, and back to scrap collection—a true closed-loop process. Scrap collection takes place from both pre- and post-consumer waste streams, with automobiles, an estimated 5 million of them in 2016, topping the list of products recycled into structural steel. Segregated scrap grades in a scrap storage yard await recycling into structural steel. Next, scrap processing takes place at a mill facility or remote marshalling yard. Typically, the scrap is shredded into smaller pieces, with ferrous scrap magnetically separated from other materials. The majority of scrap originates within 400 miles of a mill and is shipped to the mill by truck, barge, or rail. 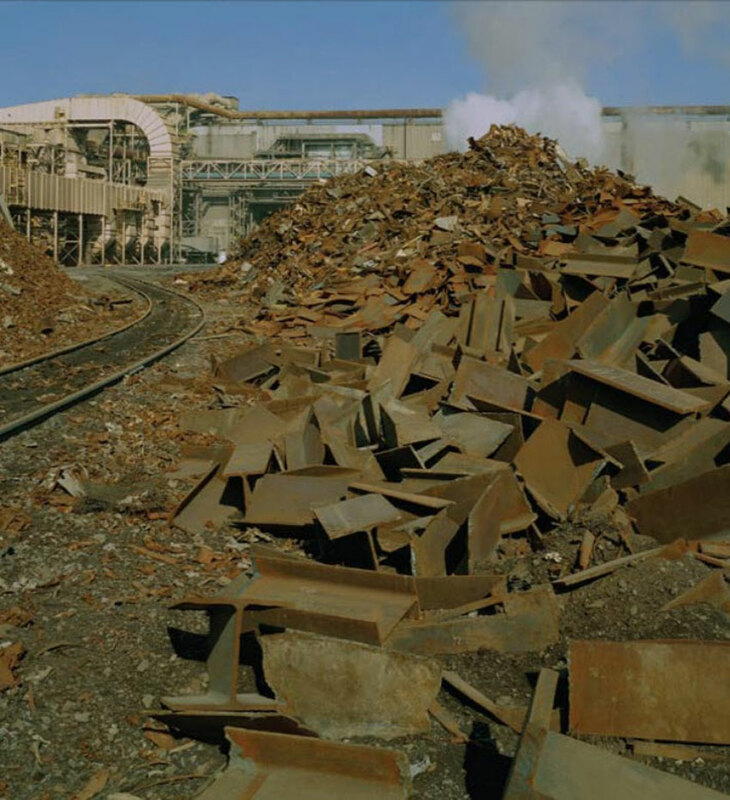 Once at the mill site, the scrap is stockpiled by scrap classification. Scrap being transferred from a barge to the scrap yard at Nucor-Yamato steel’s (NYS) mill facility in Blytheville, Arkansas. Mill production begins with placing of scrap into a charging bucket based on a prescribed “recipe” of so many multi-ton scoops of shredded automobiles, old appliances, manufacturing scrap, and demolition waste. The 100-plus-ton bucket of scrap is then discharged into an electric arc furnace, which is heated to 3,000 degrees Fahrenheit. A foamy by-product called slag floats to the surface and is skimmed off to be sold for processing into road beds, after which the remaining molten steel is transferred into a ladle. Small amounts of other elements, such as silicon, manganese, vanadium, and molybdenum, are added to create the chemistry required for the final product grade, typically A992 for hot-rolled structural steel sections. The mixture in the ladle is stirred by injecting argon gas through the mix, and after about 40 minutes, a sample is analyzed by optical spectrometry to verify the proper chemical consistency. The molten steel is then poured from the ladle into a tank from which streams of steel flow down a long mold and form into a beam blank at 1,800 degrees Fahrenheit. The steel is then quenched with water to cool and strengthen it, with the water recaptured for later reuse. The beam blank is reheated to 2,100 degrees Fahrenheit in a natural gas-fired oven and then passed back and forth through giant rollers until the steel reaches its final shape before being cut to standard mill lengths of between 30 feet and 80 feet for shipping. This entire mill process takes approximately 3 hours from scrap selection to final cutting. The rolling mill transforms the reheated beam blanks into precisely dimensioned structural sections. To appreciate the extent to which structural steel production has advanced, when the Empire State Building was built in 1931, the structural steel weighed 57,000 tons with a strength of 36 ksi. 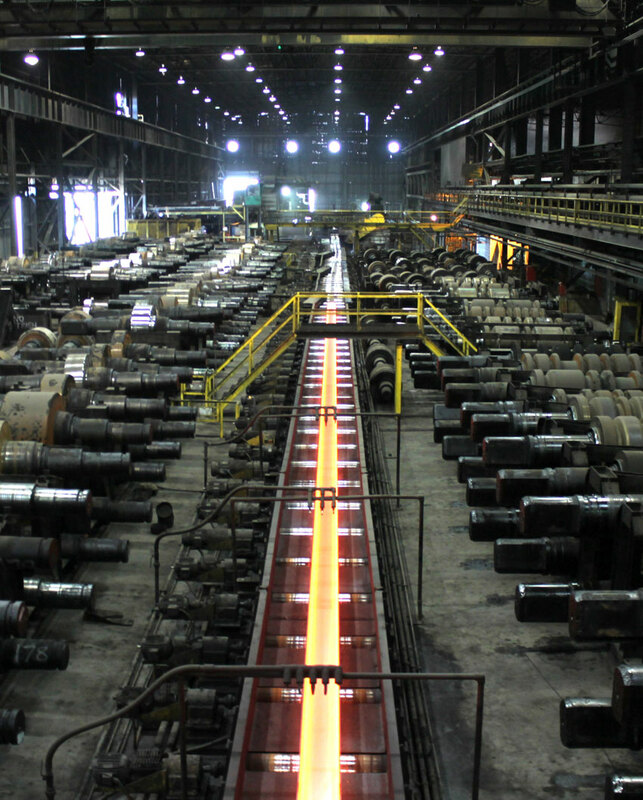 Mill production of that steel required 684,000 man-hours, with 165,300 tons of CO2 emissions being produced. In contrast, today’s structural steel, for the same project, would weigh 41,000 tons with a strength of 50 ksi. Production would only require 24,600 man-hours and result in just 39,000 tons of CO2 emissions (0.96 tons of CO2x/ton of steel). The “new” steel is then transported from the mill to a structural steel fabricator or to a service center that stocks structural steel for purchase by local steel fabricators. 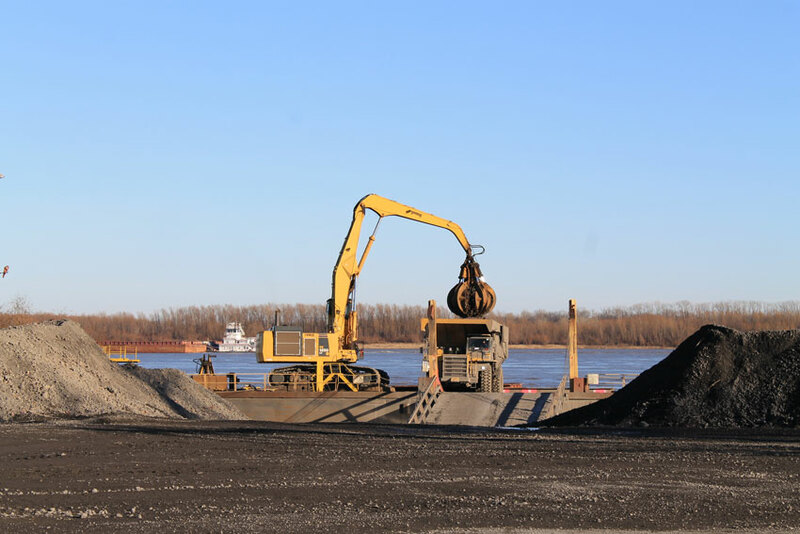 Thirty-four percent of domestically produced and utilized structural steel is transported by truck, 54 percent by rail, and 12 percent by barge. A structural steel fabricator using the structural design drawings produced by a structural engineer for a specific building project generates detailed, dimensionally accurate drawings, including connection details, for each piece of structural steel. Based upon a sequence, optimized for shop flow and project schedule, the steel members are then cut to the proper length, drilled, plasma cut or punched, fitted up with attachments for connections, and welded or bolted together in assemblies. When required, the member is cleaned and painted or galvanized. Finally, the members are grouped in the order in which they will be erected in the field, placed on a truck for shipping, and delivered to the project site. Any waste from the fabrication process is either reused on future projects or sold to scrap collectors to be recycled. Environmental impacts related to the process of fabricating structural steel are minimal. Waste rates in fabrication shops average just more than 7 percent of the original material quantities, with all steel scrap being sold to recyclers for conversion back into new steel products. For each ton of steel fabricated an average of 0.06 tons of CO2 equivalent is generated by the fabrication process. With close to 2,000 steel fabrication firms throughout the United States, local sourcing is always available. Because the structural steel has already been fabricated off-site to strict tolerances, it can be erected quickly in the field, requiring fewer workers on the job site, safer working conditions, shorter construction schedules, and reduced emissions from construction equipment. Largely connecting prefabricated components, little waste is generated on-site. Any steel waste that is generated is separated either at the source or at a scrap facility and enters the recycling process. No maintenance is required of the structural steel, as the product life of the steel exceeds the anticipated service life of the building. Steel framing systems can be modified to address changes in building occupancy, expansion, or requirements for adaptive reuse. Steel framing also supports easy integration of mechanical systems, supporting larger window areas, low floor-to-floor heights, less building volume, and lower energy consumption. At the end of any building’s life, it is either demolished with the waste deposited into a landfill or deconstructed, reusing and recycling as many of the building components as possible. Structural steel buildings are typically deconstructed, with all structural steel members removed and sold for reuse or recycling. Unlike concrete- and wood-framed buildings, deconstruction of a structural steel building can often occur at no cost to the building owner as the demolition contractor will offset their costs with the income gained from the sale of the steel.